Sometimes it's ton of fun to have a girl! Sarah has recently rebelled against hair bows. She's had a naked head for the better part of a year. Then when we were visiting my parents over New Years my mom snuck a hair band onto her head and she didn't notice it for a while. A few weeks ago we were at Target and I made a big fuss over head band and then slipped it on her head while she was distracted. At first we thought she didn't know it was there but when it fell off she was upset and shouted "Oh no! My pretty head band!" And asked us to put it back on her. Score! 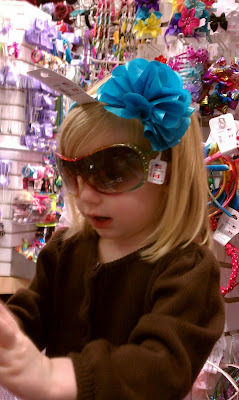 So yesterday after dr. appointments we went to the mall to see if we could find some more head bands of various colors. I was looking for a pink one to match her outfit but she fell in love with this blue one. She put it on right away and was very excited about it. Then she turned around and picked out some glasses and popped them on her face and exclaimed, "Look! I'm pretty!". The head bands were buy 1 get 1 50% off, so while I don't think she has ANYTHING to match that blue one she wanted it pretty badly so she got that and a nice pink one that will go with many outfits. We luckily got the glasses away from her when she discovered the cheap plastic bead necklaces. And though I shouldn't have caved, she doesn't have any and she simply loves them so we also got her a pack of those necklaces that I probably could have got for free if we went to Mardi Gras. When we got home she put them away in her purse to play with after her nap. We've never bought her dress up clothes or play jewelry stuff like that so it was a lot of fun to see how excited she was about it. I think I had just about as much fun as she did watching her pick it out in the store. But I'm mostly excited I've found a hair accessory that we both can agree on.